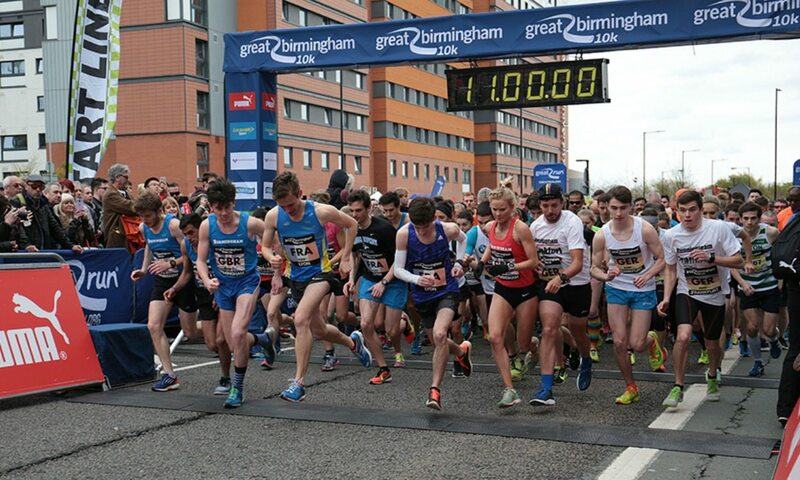 GB international mountain runner Emma Clayton and Jack Gray were the winners of the Great Birmingham 10K on Sunday (May 1) as more than 7000 people took to the streets of the city for the 10km event. Clayton clocked 34:27 ahead of Commonwealth triathlon champion Jodie Stimpson with 35:17 and Leonie Balter with 37:09, while Gray ran 31:45 ahead of Aaron Bienenfeld and Sascha Strotzel of Germany with respective times of 32:12 and 32:20. The event incorporated the Birmingham European Capital of Running 10k Cup, which saw teams from Birmingham, Frankfurt, Leipzig and Lyon do battle against last year’s winners Milan to be crowned Europe’s best team. With results based on the first men and first women from each team and an average result for the remaining four runners from each team, victory was claimed by Birmingham with 35:16 ahead of Leipzig and Lyon. The music-themed 6.2-mile event, which goes from Jennens Road to its finish on Broad Street, is organised by The Great Run Company, which also stages the Great Birmingham Run in October and recently launched the brand new Birmingham International Marathon, to be staged for the first time next year. Among the many celebrities and sporting stars taking part were Olympic medallists Ian Stewart and Wendy Sly, who is now the managing director of Great Run Publishing. UB40 cheered on the runners as honorary starters of the event, with Britain’s Got Talent star Connie Talbot serenading participants and spectators alike ahead of the start. There was no shortage of musical motivation as each wave was set off to tunes from a different decade, with 70s, 80s and 90s ‘fashion’ thrown in. David Hart, communications director for The Great Run Company, said: “It was great to see so many people not only taking part but coming along to support their friends and family too. Entries for the 2017 event are now open. For more information visit greatrun.org/birmingham10k.